Foursquare has around 6 million users. Tiny when compared to Facebook or Twitter, but what Foursquare has been able to do is show the potential of social location. What’s more there are a number of brands who have taken up the ‘SoLo’ gauntlet. Hardly surprisingly the first major brand in on Foursquare were Starbucks, who offered a now-standard offer to 4Sq Mayors. McDonalds tested the SoLo offer with their check-in day in 2010. They gave a number of prizes in the form of $5 and $10 gift cards for people to check-in. Although they measured ROI, they saw check-ins rise by 33%. GAP have created a number of Foursquare check-in offers. They started with a 30% discount on items during a holiday campaign in the US. Additionally the clothing company also donated a $1 to their supported charity for each check-in. A slightly more interesting twist is Tasti-Dlite (only the Americans could come up with a name like that) who have linked Foursquare check-ins to their customer loyalty programme. So, the principle of check-in to a retail outlet and get a discount is clearly an obvious and promising one for brands. What about some more interesting examples of how the Foursquare check-in has been used? Ironically, given the prevelance of fast food and coffee shop offers, CNN’s promotion of the Healthy Eater badge showed how it can be used for a more beneficial purpose. The History Channel worked with Foursquare by creating the History Badge. Initially they wanted to generate more interest for London’s historic sites. In fact a number of media brands including Bravo, Zagat and MTV have all made good use of Foursquare. Although the Super Bowl is a venue-based event, this year they used the Foursquare check-in to provide vouchers to redeem a discount at the NFL shop online. I have often said that Foursquare isn’t really social media, but actually the game of winning Mayor. Coke in Australia tapped into that gaming element with their Fairy Machine. Foursquare users could check-in to vending machines around Sydney with the chance of receiving a winning bottle of Coke through the dispenser. The gaming element of Foursquare was used to even greater effect by Jimmy Choo who took an imaginative approach by creating a treasure hunt to win a pair of sneakers. Check-ins were to some of London’s cooler haunts. Another great example of the creative use of SoLo is Nike (where are they not creative?). OK, so they used Facebook Places, but their Sneak and Destroy Burrito trucks are a great example of getting everyone talking through SoLo. Of all the FourSquare campaigns, the one that showed how brands can really do it, is the Dutch airline, KLM. Their KLM Surprises, offered a gifts to the airline’s travellers who checked-in on Foursquare. They wanted to help relieve the boredom of waiting for a flight with a bit of fun. They didn’t tell customers the gifts were available, they just offered them. Even better they used their Twitter and Facebook information to make the gifts as relevant as possible. One woman passenger had a photo of herself in sports gear so they gave her a Nike running watch. Another passenger who used his iPad to check-in was given an itunes voucher. Brilliant. What KLM have shown is that brand engagement in SoLo doesn’t just have to be about giving discounts or free coffees. It’s about making customers feel good about buying from your brand. If BBM is so popular, why isn’t everyone doing it? It’s a question I’ve been asked quite a bit recently. Blackberry is THE handset of choice for teenagers and early 20s. And the reason is BBM. Why BlackBerry messenger? First and foremost it’s free without a contract. It allows group conversations, it allows anonymous forwarding of messages. That’s the main reason why teenagers use BlackBerry, but there are a few other reasons. BlackBerrys have buttons. Touch screens are slow and hard to use on the move. Buttons can be used with two thumbs making it much faster to type. And BlackBerrys are cool. Maybe you thought the iPhone was cool? It is if you are over 25, but not if you’re a teenager. Just as BBM started to catch on, the BlackBerry was paraded around by the likes of Paris Hilton, various rappers and in Gossip Girl. Of course the thing about BBM is that it’s adoption is the same happy accident as SMS. It was clearly invented as a business tool, but teenagers liked it because it was fast and cheap. Before BlackBerry knew it they were the teen object of desire. So why wasn’t it MSN? After all teenagers were already using MSN on their PCs? The primary reason is one of cost. You needed a data tariff on the handset before you could use it. BBM is free. Both handset manufacturers and operators have tried to introduce something similar. In the UK there is Orange friends. Nice idea, but it’s not going to work. Firstly, operator-based communication channels have a history of failure (dare I mention Vodafone 360?). Teenagers don’t mind being tied to a handset, but they don’t like being tied to a particular operator. Operators aren’t cool. Handsets are. So what about things like Skype, iChat and other messenger services? The short answer is that it’s simply too late. BBM has stolen the market, and it is nearly impossible to catch up. If all your friends are on BBM, switching to another channel is akin to social suicide. There are also a few usability issues to throw in. If you want to use MSN or iChat you need to keep the app open. BBM is already there. Will BBM see the end of SMS? There is no evidence that BBM will see the death of SMS. True, teenagers are switching away from email, but they are still using SMS to communicate with those who don’t have BBM (they’re called adults). One key issue is that the last time teenagers adopted a cheap, fast messaging system it was SMS in the 90s and look what happened to that. We are now at a point where more people use SMS globally than make phone calls. SMS also brings massive revenues for the operators. But BBM will not necessarily have the same rate of adoption for a couple of reasons. Firstly, unlike SMS it isn’t universal. It’s only Blackberry and they have little over 5% of the global handset market. SMS was built into every GSM network as standard. Secondly, there’s no significant revenue opportunity for the operators. The value of BBM is in selling handsets. True, the operators make money on their handsets, but their primary source of revenue is in subscriptions – making money from voice, SMS and data (maybe). From a brand marketing perspective, this means that SMS is still significant. It is still very much the call to action, the thing that more than 90% of people use, more than 90% of text messages are read and more than 90% of people remember what a brand message said. BBM has a long way to go before it can catch that up. A number of stories appeared this week suggesting that Apple will be releasing a small ‘nano’ version of the iPhone. It’s not the first time these rumours have been around, but the story this week was started by a report by Bloomberg. They indicated that Apple are looking at a cheaper, smaller phone to beat off competition from Android. The report was based on an anonymous source (Apple rumours are always anonymous), who had seen the smaller, nano-style phone which apparently had no ‘home’ button (very unApple). In some ways it seems logical that Apple will release a Nano iPhone. They have a 5% share of the global mobile phone market, so there is plenty of room for improvement. There is increasing competition from manufacturers such as Samsung and HTC who are matching Apple for quality, but fulfilling the lower-end smartphone handset market. The iPhone 4 is a premium product, and the price means that there are many people who can’t afford it. Whilst Apple has success in certain markets such as the US and Western Europe, they face stiff competition in regions such as Asia. Even in Japan, where Apple had 75% of the smartphone market, Samsung made some significant gains at the end of 2010. 1. Apple don’t need a lower end iPhone. Given that Apple are making more profit than all the other handset manufacturers put together, dominating the market by volume isn’t really that important. True, Steve Jobs once said that one day all phones would be iPhones, but I think we can put that down to bravado. It is not consistant with Apple’s market strategy to date. 2. A smaller iPhone isn’t cheaper to build. Building a smaller iPhone is technically problematic, and wouldn’t be any cheaper. Reducing some features such as such as a camera or memory may help keep costs down, but not significantly so. 3. A different size screen would create compatibility and usability issues. Apps would have to be redesigned (there’s 250,000 of them in the app store) and the virtual keyboard would be much harder to use. It is unlikely therefore that Apple will produce a smaller model of iPhone. If Apple are to go the route of an cheaper model of iPhone then the solution may lie in a stripped-down version of the existing phone. Keeping the screen size the same will remove two of the three issues outlined above. They could reduce some of the functions such as the memory, cameras (no forward facing cameras) and a lower resolution screen. Apple will still need to take care to ensure that they don’t take out the ‘iPhone-ness’ of a cheaper device. In the end, the decision will come down to how much of a threat (or perceived threat) there is to their profitability with their existing mobile offering. They said that it would be ‘the year of the tablet device’, and two months in it’s already looking that way. Some useful stats here, tell us that there are over 100 different devices on the market which call themselves a tablet. According to the report on ZDNet, it is believed that sales will be up to 200 million units very soon. The big growth will not be in Apple’s offering but a low-end market (under $100) which will eat into the low-end PC market. Nokia and Microsoft: what’s the real story? A few years ago few consumers cared about mobile operating systems. And quite rightly, as long as the phone did what you needed then who cared what the OS was? Then along came the iPhone, doing what Apple does best: great product design, fantastic interface and an appstore where you could download great games and apps. With Apple’s game changer came the mobile OS wars. The biggest looser was Nokia. To be fair, they’d already started to loose the plot before the iPhone came along, but post-Apple, the world’s largest handset manufacturer turned out a number poorly though-out phones that were way off the mark. In the meantime, BlackBerry were doing very nicely (thanks in part to the teenage adoption of BBM) and Android was appearing on some really great phones. In fact, Nokia do some great product design. My personal favourite was the 1100. The biggest selling information technology device ever. They even dominate the smartphone market in terms of sales. Where they have failed is OS. Symbian was a great OS for feature phones. 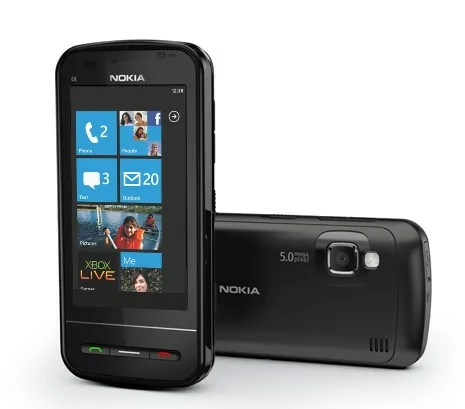 Many people, myself included would only by Nokias as Symbian offered the best usability out there. However, iOS and Android showed how it really should be done. To be fair, Nokia tried to address the OS problem, implementing new versions of Symbian and starting the MeeGo project with Intel. However, mobile is a rapidly changing consumer environment and the time taken to develop MeeGo would be too long. So in terms of a business relationship the partnership with Microsoft makes sense. The latest version of Windows on mobile is good. But it’s not great, in the way that iOS and Android are. Predictions were that Windows Mobile would not take off. So for Microsoft to partner with the world’s biggest handset manufacturer makes complete sense for them – in fact it may be the only way their mobile offering will survive long-term. However, it will be a hard task to beat the likes of Apple and Google in the OS wars. Windows Mobile would have to be utterly brilliant to do that, and it isn’t. I believe there is one massive opportunity that this partnership offers: the combination of Xbox Kinect and Nokia Imaging. It could put Microsoft/Nokia the very heart of mobile gaming. Fancy a Dongle? We’d rather have a smartphone thanks! A recent YouGov study has found that people in the UK are no longer insterested in USB dongles for mobile internet. Just 7% of people said they would consider buying one in the future, whereas a year ago it was 14% of those surveyed. In 2008 it was 20% of people. So what’s changed? For a large part it’s the emergence of the smartphone. With around 35% of the population owning one, more people have access to email, Facebook and other typical mobile activities. The study found that even where smartphone owners also have a dongle, they tend to opt for the handset to conntect to the internet. It would seem that much of that is down to user experience. Mobile optimised apps and web are faster to browse than traditional internet. In 2010 the telecoms regulator, Ofcom, commissioned a series of test to find out how fast dongles really were. Initial results showed that speeds were often similar to dial-up and the ‘broadband’ description was misleading. For the last two years, we have frequently seen spam accident claims text messages. Having taken many a straw poll at events and conferences it seems that a significant percentage of people in the UK have experienced these messages. Free Msg; Our records indicate you may be entitled to £3750 for the accident you had. To claim free reply CLAIM to this message. To opt out text STOP. The number that it comes from frequently changes, as does the reply keyword (eg CLAIM or YES) and the amount. Who is sending these messages? The people sending out these messages are known as ‘claims farmers’. These are companies who find leads and then sell those to accident claims management companies. By the time they reach the claims management service, they are verified leads of people who may well have a legitimate accident claim. There are 100s of claims farmers in the UK and it would seem that many of them are involved with this type of SMS activity. RBS Insurance did a study last year and found that 11% of accident claims started with this type of SMS. 1. The company sending the message is not identified – some people think the company is called ‘FREEMSG:’, however that is simply telling the recipient that the message was free to receive (which it is). 2. The recipient did not opt-in to receive the message. There are two types of opting-in – a hard opt-in is where you specifically agreed to receive the information, and a soft-opt in is where you may have been in contact with a company to buy something or a discussion about buying something, or you may have allowed your details to be given to a third party for marketing purposes. Typically companies sending spam will claim that you gave your details on a website at some point. However, the onus is on them to show exactly where they got your details and prove that you opted-in. Simply saying ‘you gave your details on a website’ is not acceptable. It is clear from the number of people I have contacted that they would not have given out their mobile phone details at any time. Accident claims and debt management companies are regulated by the Ministry of Justice (MOJ). Under their regulations, claims marketing messages cannot be misleading or alarming. These text messages breach both of those requirements. You can complain by email: info@claimsregulation.gov.uk or by phone on 0845 450 6858 or 01283 233 309. Will receiving or replying by SMS cost me money? The short answer is no (apart from any cost to send a standard SMS). Any SMS that makes a charge to your phone must come from a shortcode number (4,5 or 6 digit number), and there are strict set of guidelines that make it very difficult to do illegally. If you feel that it may have cost you money then contact the regulator, PhonepayPlus. They have emergency powers to shut down any service that breaches their regulations. What should I do with the SMS? Reply, delete it or report it? Some people believe that SMS is like email, and that replying to it will verify the mobile number. That is not the case with SMS. All text messages include a delivery receipt, so the sender knows that you have a live mobile number without you having to reply. On the whole it is better not to reply to the messages. There is no evidence that replying to the message will initiate further texts or calls (I have replied to a few of them and received just one phone-call back), however if you are worried about further spam, then don’t send a reply. You could reply telling them to ‘Fcuk Off’. It will make you feel better, but it will do nothing. In all likelyhood their systems will only recognise the reply words in the message (CLAIM or STOP), so your reply will simply end up unnoticed on the server. If you really want them to read the message then start your reply with the keyword (eg CLAIM) then tell them to ‘Fcuk Off’. Or better still, tell them that you are reporting their spam to the MOJ (see below). DON’T DELETE THE MESSAGE. Even though it’s annoying to have it on the phone, it cannot damage your mobile in any way. You WILL need the message on your phone if you are going to do make a complaint. Definately report it to the MOJ (see emails and phone numbers above). They may or may not be able to do something but it is essential they know it is happening. The MOJ are very concerned about this kind of activity. Alternatively complain through their customer service department. Ultimately your operator can only help filter the messages, not stop them entirely. Filtering SMS can be problematic as unlike an email they lack any real data – it can only see the message and the sending number. Thus, variations in the message or the number it comes from may by-pass the spam filter. However, keep report it as it all helps them deal with the problem. 1. Rogue individuals at mobile operators – although the operator will not have sold your number it is possible that someone working or contracting for them did do that. There was an incident with a T-Mobile employee doing just that in 2009. 2. Unscrupulous data providers – this is the most likely route. These providers collect numbers through a range of sources such as websites or online surveys and sell them on, claiming they are legitimate. 3. Number generation – there are set operator codes, so it is possible to take those codes and randomly generate the last six digits. This, however is quite an expensive way to send messages, as many of the SMSs will fail (but the spammer will still pay to send them). The ideal way to deal with the spammers is to find out exactly who the company is and report the information to the MOJ. Unfortunately that means replying to the message. I haven’t had any noticable spam as a result, so if you are prepared to take the risk then it’s worth it. It is really important to get as much information about the company as possible. At the every least their website address. Ideally get them to confirm by email or SMS. They have been known to deny phone conversations. If it is a phone conversation then make notes of the date and time of the call, the number they called from (if you have it) and the name of the person you spoke to. Once you have the information, send it to the MOJ. I replied to one of the accident claim texts. About four days later I got a call from a withheld number. The caller said ‘we believe you have been recently injured in an accident’. I asked who was calling, and was vaguely told that they were a ‘network of claims managers’. They said my number had been passed on by another company. I asked who that company was and they told me they didn’t know. I asked them to call back with the company name and they said they would. Suffice to say I’ve never heard back from them. If you have experienced spam SMS from accident or debt management companies, then please add (a shortish) comment here.